Vibration Reduction (VR) is an image stabilization technology that minimizes blur caused by camera shake. Using a VR NIKKOR lens can result in sharp images in low light, under windy conditions or when using a physically large NIKKOR lens, at up to four stops slower with a VR lens than a non-VR lens. This number of f/stops is based on CIPA standards and will change depending upon the specific lens. The value is achieved when a DX-format compatible lens is attached to a DX-format D-SLR camera and zoom lenses are set at the maximum telephoto position or when an FX-format compatible lens is attached to an FX-format D-SLR camera and zoom lenses are set at the maximum telephoto position. Nikon VR originates in the lens, not in the image sensor, which means that algorithms optimized to an individual lens are applied. Another advantage of lens-based VR is that a separate algorithm confirms the stabilization effect when you press the shutter release button halfway, giving you the freedom to compose your image more easily. The system can also detect the use of a tripod, recognize panning―an instance in which you wouldn't want the lens to compensate for movement―and address the specific shake caused by the ongoing vibration patterns produced when shooting from a moving vehicle. 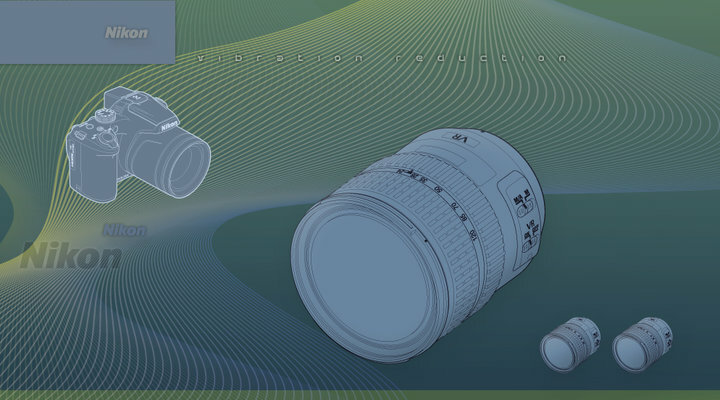 Nikon VR lenses use two angular velocity sensors, one that detects vertical movement (pitch), the other, horizontal movement (yaw), with diagonal motion handled by both sensors working together. The sensors send angular velocity data to a microcomputer in the lens, which determines how much compensation is needed to offset the camera's shake and sends that information to a duo of voice coil motors that move selected lens elements to compensate for the detected motion. What does this mean in practical terms? A rock-steady camera is essential to critical image sharpness, and Nikon’s exclusive Vibration Reduction technology offers the perfect solution for reducing the image blur caused by camera shake. It provides you with up to four stops of "hand-holdability," delivering dramatically sharper images in a wide range of conditions. Not all anti-shake technologies are the same. The in-camera anti-shake technology used by some manufacturers relies on a process that actually shifts the image sensor, and its performance benefit is generally agreed to be limited to about one-and-one-half to two stops. For Nikon photographers, an additional two stops of VR performance capability can easily be the difference between a blurry picture and a beautiful sharp one. But the benefits of Nikon VR aren't limited to shutter speeds. Consider shooting on an overcast day at a medium ISO where greater depth-of-field might be desirable. Because using a Nikon VR lens means you've got up to four extra stops available, you can choose an aperture of f/8 rather than f/2―and there's your depth-of-field. And having up to four stops to work with also offers the possibility of shooting at lower ISO settings, thus maximizing image quality. Click here for more on Nikon's VR technology. Vibration Reduction (VR) is an image stabilization technology that minimizes blur caused by camera shake. Using a VR NIKKOR lens can result in sharp images in low light, under windy conditions or when using a physically large NIKKOR lens.